These high temperature, high energy, capacitors are manufactured with a dielectric formulation designed for reliable operation under single or repetitive high energy, multiple pulse, firing into typical EFI and LEEFI circuits where resistive loads are in the 0.10 to 0.25 Ohm range. Discharge pulse width, which is typically less than 100 nanoseconds, will vary with load conditions which are influenced by inductive and resistive load components. With exceptionally low ESR and low signal distortion, additional applications at high temperature include power supply filtering, energy storage and coupling/decoupling. All parts are 100% pulse screen tested and are evaluated at temperature extremes up to 200ºC consistent with munitions and oil field exploration/seismic detonation conditions. As an added safety feature, these pulse energy capacitors can be supplied with integral bleed resistors at various resistance values. 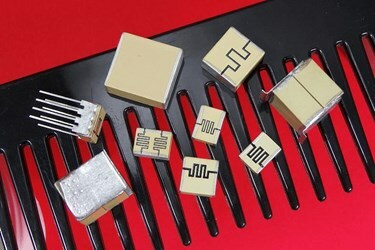 Offered in chip sizes 1825 to 7565, other sizes, voltages and capacitance ratings are available in single, series and series/parallel arrangements for custom applications and provide exceptional discharge energy at elevated voltages. A 500 Megohm safety bleed resistor is standard but other values are available. Novacap’s design engineers are on hand to help design the proper solution to meet specific requirements. Dielectric Laboratories (DLI), Novacap, Syfer Technology and Voltronics came together to form a single organisation, Knowles Capacitors - they have now been joined by Johanson Manufacturing. This entity has a combined history exceeding 200 years and is a division of Knowles Corporation of USA, an independent publicly traded company.